On the Central Coast, we rely heavily on our highways, railways, and airports to connect us to the rest of California and the country. A safe and efficient regional transportation network to connect our communities is critical to encouraging economic growth and maintaining the quality of life for families in our region. As a member of the House Transportation and Infrastructure Committee, I understand the need to invest our federal tax dollars here on the Central Coast and better support local governments in building and maintaining infrastructure. I was elected to serve as Vice Chair of the Transportation and Infrastructue Committee, a position reserved for an active member of the committee who has served in Congress for less than five years. In this role I'm working with the committee to help put Americans back to work by securing robust investments in our nation's crumbling infrastructure and to ensure the long-term solvency of our Highway Trust Fund. My first year in Congress, the President's budget attempted to cut $122 billion from highway programs, after the expiration of the current highway bill. It also cut discretionary transportation accounts, including reductions in Amtrak, and the elimination of TIGER grants and cuts that capital investment grants programs. On the House Budget Committee, I questioned the Director of the Office of Management and Budget (OMB) Mick Mulvaney on the White House Budget’s elimination of funds for Transportation Investment Generating Economic Recovery (TIGER) grants. Thankfully, these programs were ultimately reinstated. 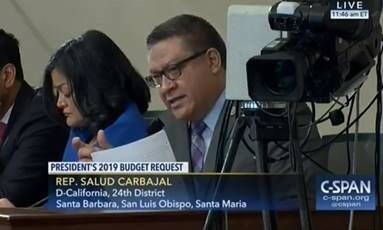 While in Congress, I have strongly supported Santa Barbara County and San Luis Obispo County’s bids for TIGER grants, which would help fund the Highway 101 widening and much-needed improvements to Highway 46. These routes serve as a critical resource for the economy by facilitating tourism and the transportation of Central Coast agriculture. When access to the Central Coast through Highway 101 was disrupted by the Montecito Mudslides, Highway 46 served as a critical alternative route for goods and services to local communities. According to the American Society of Civil Engineers, California is currently home to over 1,300 structurally deficient bridges, 678 high hazard dams, and 50% of its nearly 200,000 miles of public roads are in poor condition. Infrastructure repairs and improvements are vital to so many industries that we rely on and help us get out families home safely. However, little action has been taken by Congress in the past few years to provide substantive funds for our nation’s crumbling infrastructure. Repeatedly employing stop-gap funding measures for this critical need is only holding back our local economies. I have partnered with colleagues to cosponsor bipartisan legislation that encourages innovation and development. The Regional Infrastructure Accelerator Act establishes a program to facilitate investment in and the financing of certain infrastructure projects. To continue to thrive in a global economy, America must act as a leader in innovation as we face a changing climate and address the subsequent threats by investing in clean renewable energy, building climate-resilient infrastructure, and committing to reducing harmful greenhouse gasses. I introduced the bipartisan Water Infrastructure Resiliency and Sustainability (WIRSA) Act to establish an Environmental Protection Agency (EPA) grant program for communities to improve the resiliency and adaptability of their water-related infrastructure. Natural disasters, like the one we experienced during the Montecito Debris Flow, show us the importance of building resilient infrastructure as we grapple with the effects of climate change and an ongoing drought crisis. We need to work together to make substantive investment in our country's network of transportation, energy, water, broadband, and civic infrastructure in order to create quality good-paying American jobs in the process. For more information concerning work and views related to transportation and infrastructure, please contact our office.